Unforgotten is the sequel to Kristen Heitzmann's book, "Secrets." Lance Michelli and Rese Barrett travel to his old neighborhood in the Bronx, New York. * He persuades Rese to make the trip based on reporting his findings to his Nonna Antonia. What Rese gets is a serious dose of culture shock, loving family, and an understanding of what makes Lance tick. The experience will either make or break their tenuous relationship. On the other hand, Lance discovers his assignment is far from over. New revelations about his family's past and the purpose he's been seeking all his life send him careening to the brink of insanity. 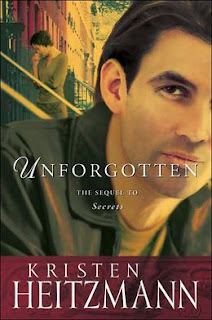 While I enjoyed "Secrets," the second book ran much closer to Kristen's style. Her multi-faceted characters and their struggles kept me turning the pages. She also avoided the pitfall of the perfect romance/couple. Both of these characters exhibit flaws and learn to deal with each other's shortcomings. Growing up in the Italian-American community, I found the author's treatment of the setting and culture well researched and believable. She did a great job. While this is a stand-alone novel, I recommend that you read, "Secrets," first to get the full story. It will enrich your reading experience. * Note: This NYC borough is never called, "Bronx, N.Y.," by the natives. It's "the Bronx." Writers: Do you ever right about your hometown? Please share. Readers: When a writer uses your geographic location, does it make the story richer for you? In what way? This seems like a really interesting book! I am definitely going to check this out.